Consumerization, mobility and the cloud are making video available to a broader set of users and increasing its use in the enterprise. It’s not a matter of if enterprises should develop a video strategy; it’s when – and in support of what critical business processes. Aragon’s client inquiries and conversations with multiple global organizations indicate that video is already being used for business purposes, both internally and externally – but often outside of enterprise control and knowledge. Left ungoverned, it can stress network resources and expose sensitive information to unauthorized use. 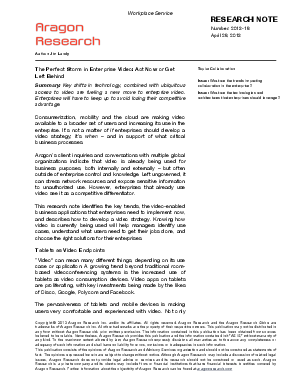 However, enterprises that already use video see it as a competitive differentiator.